The Pantsir-S1 has an effective range of between six and nine miles. 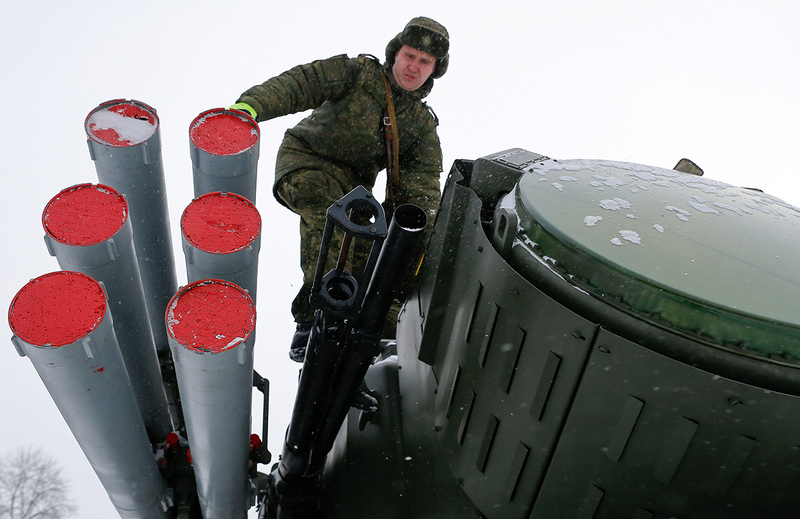 The missile defense forces guarding Moscow were put on high alert in a snap drill. RBTH reports on how the Russian capital’s skies are kept safe at all times. Russian air defense troops guarding Moscow scrambled in accordance with the presidential decree on a snap inspection of the Air Force. This also involves anti-missile defenses such as the S-300, S-400, and Pantsir-S surface-to-air (SAM) batteries stationed just outside Moscow. The drill called for troops deploying to their assigned railroad loading positions and defending against saboteurs. The units involved in the exercise are just a tiny part of the shield protecting Moscow against all sorts of attack from the sky. The Moscow anti-air and anti-missile system starts well beyond the city limits, with radars for the ballistic missile early warning system, said Viktor Litovkin, a military analyst with TASS news agency. These radars have a range of up to 3,600 miles. Litovkin said this is just a part of the radar field covering all of Russia and neighboring countries, and it can detect all ballistic and cruise missiles, aircraft, and other flying objects traveling towards Russia. “All the early-warning radars report to the headquarters in Solnechnogorsk outside Moscow, and to the Don-2n control center [itself a massive radar] in Fryazevo, Moscow region,” said Litovkin, adding that Russia’s space surveillance system also feeds information to Fryazevo. The Don-2N controls 100 anti-missile missiles located around Moscow, and they can intercept any ballistic and cruise missiles aimed at the capital. The exact locations of these anti-missile systems are secret. “Any early-warning signal will be relayed to the missile defense headquarters and to the Don-2N radar, and a decision on how to neutralize the airspace intrusion will be produced immediately,” said Litovkin. Moscow’s anti-missile system closely cooperates with the air defenses of the Moscow Region, which are based on S-300 and S-400 SAMs. These systems detect aerial targets at 130 miles to 240 miles away, and can shoot them down at between 90 miles and 150 miles away, even if the target is traveling 5,600 miles per hour, which is seven times the speed of sound. Any of the S-400 and S-300 units can detect and track up to 36 targets; each launcher is capable of simultaneously engaging 12 targets. The exact figures of the size and strength of the air defense force protecting Moscow are classified, but it is believed that the number of interceptor missiles is in the hundreds, as is that of the detection, tracking, and guidance radars. The Defense Ministry's plan calls for bringing the number of S-400 SAM regiments around Moscow up to 12 by the year 2020. Moscow has sufficient air defenses to protect itself against aerial attack, experts believe. Russian military doctrine says that Moscow retains the right to use nuclear weapons if attacked, primarily against a state or alliance that also has nuclear munitions.